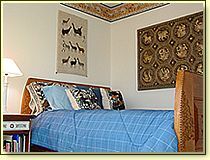 "Refuge for the soul and feast for the senses"
View the tranquil Upper Garden from large windows of this sunny, skylit room featuring art and crafts with garden themes from New Zealand, Thailand and Mexico. 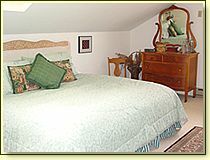 King-sized bed, private bath with shower: $135 weekends & holidays. Weeknights (Sun - Thurs): $115. 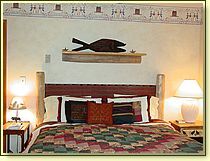 Rates are based on double occupancy for 1 night and do not include sales tax or gratuities. MasterCard, Visa, cash, travelers and personal checks accepted. Please check-in between 3 and 10 p.m. Check-out is 11 a.m. Luggage and small equipment can be stored for short periods.